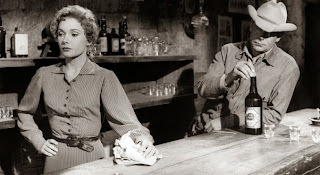 One of the finest scenes in American cinema is in 3.10 to Yuma (1957), when the outlaw Ben Wade (Glenn Ford) comes to a saloon and, instead of playing the tough macho role, becomes very tender and sweet when he meets the bar maid (Felicia Farr). The long, quiet scene ends with them disappearing into the back room. She says "Funny, some men you see every day for ten years and you never notice; some men you see once and they're with you for the rest of your life." in a sequence that is a reminder that Delmer Daves, before he began making his own films, was one of the writers on the script for Love Affair (1939), the last of Leo McCarey's trio of emotional masterpieces. * 3.10 to Yuma is Daves's most famous film, and possibly his best. It is very well acted, both tense and moving and it looks beautiful, not to say spectacular, with a unique view of the West. But he did several fine films. They are often emotionally complex, show a willingness to discuss social issues and have impressive visuals, not least his crane shots that have the capacity to add meaning and emotions when they appear, sometimes even introducing a sense of some larger force watching over the characters. Besides 3.10 to Yuma, Jubal (1956) and The Hanging Tree (1959) are two of his very best. More famous is Broken Arrow (1950), which I am not that keen on. It is a bit stiff and the dialogue is too explicit, but it has some moments of greatness. 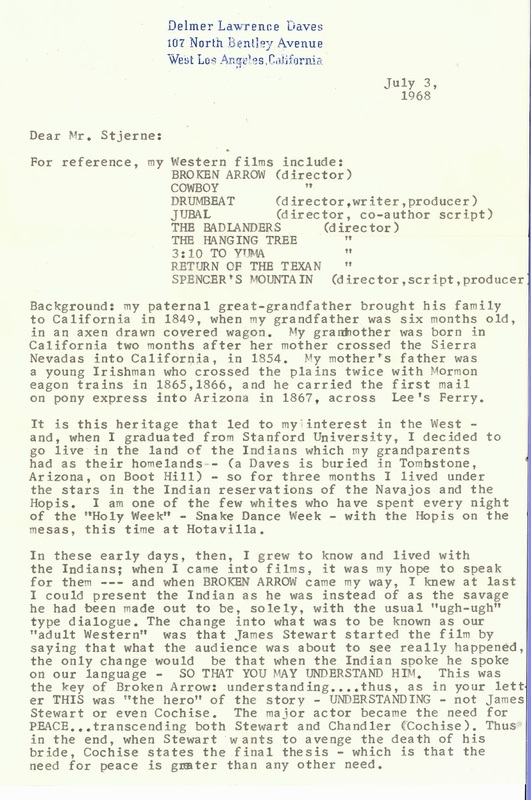 (The claim that it was the first western that showed Native Americans in a positive light is of course wrong, that had been done before, many times and sometimes with more subtlety.) Before Daves turned to the West he did different kinds of films, such as the two he made in 1947, Dark Passage and The Red House. Dark Passage is a thriller, a slightly off-beat experiment that is sometimes genuinely unsettling, and Daves uses the San Francisco setting to wonderful effect, even though Bogart and Bacall in the leads lack the sparkle that they had under Howard Hawks's direction in To Have and Have Not (1945) and The Big Sleep (1946). The Red House is less accomplished but also unsettling, a tale of family secrets and Freudian complexes in a lyrical summer setting. At the end of his career Daves made a series of romances, starting with A Summer Place (1959), that I have not seen unfortunately. But I have heard good things about them. I would be curious to see if he brought the same sense of alienation to the teen romance that he did to many of his other films. "You know, what we have in common is that we're both lonely." says a man to a woman he just met at a bus station in the end of Dark Passage, and they are not the only characters in Daves's oeuvre that feel this way. I am not an expert on Daves so I will not write any more. Instead I will let Daves speak for himself. 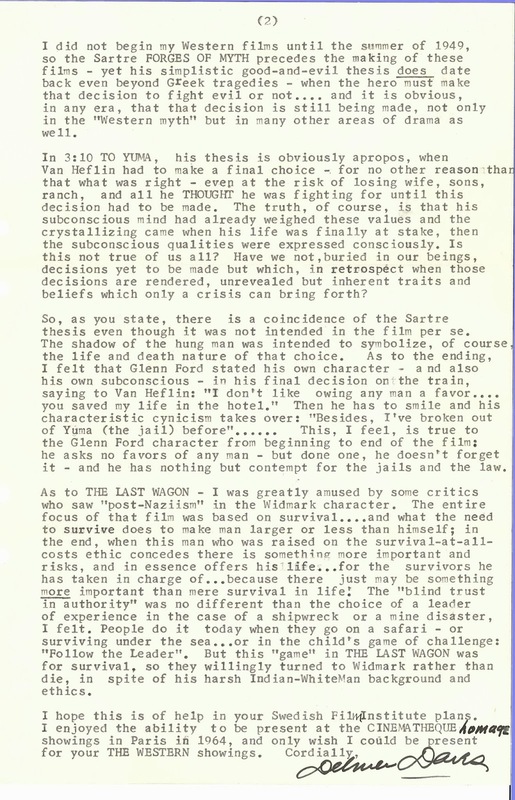 The archives at the library at the Swedish Film Institute (where I work) hold a lot of fascinating documents and here is a letter from Daves where he writes about himself and his films, invoking Jean-Paul Sartre, Greek tragedy and his childhood. 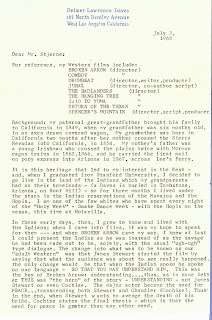 He wrote in response to a retrospective of western films that the Film Institute's Cinematheque was organising in 1968. It is a great read. *Leo McCarey's two other films in that trio are The Awful Truth and Make Way For Tomorrow, both made in 1937. Here is Glenn Kenny's celebration of one of Daves's last films, Youngblood Hawke (1964). 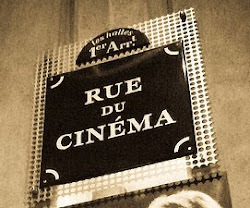 To criticise or dismiss classical Hollywood because of censorship or constrictions placed on the filmmakers by producers, or for its alleged propagandistic purposes, is common enough. The very same people who take that approach towards Hollywood are however often in favour of Soviet cinema of the 1920s. It should be clear then that their issue with Hollywood is not censorship, constrictions or propaganda but that they just do not like the films or the politics they feel that those films project, but prefer to phrase their dislike in more "objective" language. After all, if they were so alarmed by restrictions and propaganda in general they should abhor Soviet cinema since it is quite obvious that making a film under, say, Darryl F. Zanuck was a walk in the park compared to making a film under Josef Stalin (Zanuck might at worst yell at you, Stalin might have you shot) and it was not possible to make a film which did not glorify the revolution and the dictatorship in Moscow. But, just like in Hollywood, the filmmakers still managed to make spectacular films of great force and beauty, regardless of their questionable politics. The most famous of the Soviet filmmakers is of course Sergei Eisenstein, with Dziga Vertov a close second. But it is Alexander Dovzhenko who is the focus of this post. He was from the Ukraine, born in 1894, and his most famous films, Zvenigora (1928), Arsenal (1929) and Earth (1930) are all hymns to the people and landscape of Ukraine, as well as to the Bolsheviks. That is his unique contribution to Soviet cinema of the 1920s. Those three films also constitute the bulk of his achievements. Some also hold Aerograd (1935) in high regard, even though it is a bit of a mess. That one is not about the Ukraine but other later films are also set there, like the biopic Shors (or Shchors, 1939). 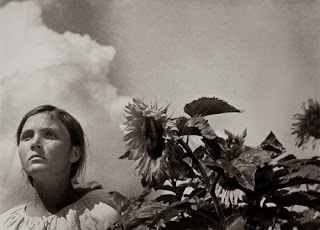 Above is an image from the beginning of Earth, and shows Dovzhenko's eye for poetic compositions and juxtapositions of humans and nature. That is one of his strengths, and a reason why his films can be appreciated without subtitles. Even though they are communist propaganda they have a certain religious sentiment, or spiritual theme, which is not to be found in the films of Dovzhenko's Soviet contemporaries. Maybe pantheism is a word that describes his films. They could also be called portentous due to his habit of having his characters staring into space and say deep and meaningful things about life, death, the soil, or the revolution. But that is balanced by scenes like one in Earth when a man suddenly starts to dance when walking on a country road and then dance his way forward rather than continue walking, just being thrilled by being alive and at peace with his surroundings. Another strength of Dovzhenko is montage, which is of course what is to be expected from a Soviet filmmaker of the 1920s. This railway crash in Arsenal is an example. So there are powerful emotions and great beauty in Dovzhenko's best films. But there are also nauseating scenes like the end of Aerograd when the war machine of the Soviet Union is glorified and an officer with a beaming face and immaculate white uniform says: “Long live Aerograd city which we Bolsheviks are establishing today on the shore of the Great Ocean.” The man is shining like he himself was the sun. There is sometimes a very thin line between communist and fascist propaganda, which should be acknowledged. Dovzhenko did not do all that well after Aerograd, cinematically, and during the war he served at the front, as a journalist. He died of a heart attack in 1956. His reputation is no longer what it was, and his films are not automatically listed among the best ever made as was once the case, but he is worth the trouble to investigate, at least the films of the period 1928-1932. On Yasujiro Ozu and "Japaneseness"
Something that it seems to be more or less mandatory to add when writing about Ozu is that he is "the most Japanese" of Japanese filmmakers. Yet, it is seldom said without the quotation marks. So when for example Donald Richie writes about Ozu in his A Hundred Years of Japanese Film (2005) he will not say up-front that Ozu is the most Japanese of filmmakers, he will remove himself somewhat from the statement and phrase it this way: "makes him, as is so often said, 'the most Japanese of directors.'" (p. 124) as if Richie dare not say such a thing himself yet he likes the claim enough to want to mention it. But how does that work? How is one Japanese filmmaker more Japanese than the next Japanese filmmaker? Is there a scale from 1 to 10 of Japaneseness, where Ozu is a 10 whereas Kon Ichikawa is an 8? Where is Kenji Mizoguchi? The ease with which critics use his nationality as the key to his artistry is a little unsettling. (And it forgets the considerable influence for example Ernst Lubitsch had on Ozu.) And is a similar ranking being done within other national contexts? Does someone consider Werner Herzog "the most German of German filmmakers." Or is it Fritz Lang who is the most German? Does it matter? Does it make any sense? You might think that this is a Western thing, and call it Orientalism. But that would be to simplify the situation. 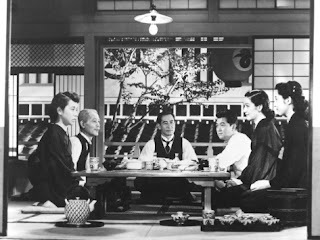 Many in Japan have similar ideas about Ozu for one thing and it often happens that filmmakers, as well as others, are surprised that their films are understood or liked by spectators from a country or culture different from their own. Once when interviewing the Greek filmmaker Pantelis Voulgaris I said I really liked his film It's a Long Road (1998). His wife, who was the interpreter, looked at me with bewilderment and said "But why? You're not Greek!?" All of this is dispiriting because it suggests that for some it is strange that one culture can understand another, as if the audience lacks imagination, being unable to understand or enjoy stories that were not about people exactly like themselves. But is not one of the reasons we watch films or read books that we want to engage with stories about people unlike ourselves? I would like to think so. There is a lot to say about identification, sympathy, empathy and such but that is for another post. Since it is the 60th anniversary of Yasujiro Ozu's Tokyo Story I have re-watched it yet again. It is on many levels a very good film. The formal elegance and precision is wonderful, and it is filled with warmth and humanity, and it is very moving. But there is one thing that I have a problem with, and that is its superfluous, or overtly explicit, dialogue. In the beginning there is a sequence where the old couple the film is about is seen packing for their trip to Tokyo. A neighbour stops by and they talk about them going to Tokyo to see the children and the neighbour says that it must be lovely and wonderful and the children must be looking forward to it so much, and so on. This is the first instance of this recurring feature in the film, that at regular intervals a character will say something that is meaningful for the plot, which is then repeated by another character. Towards the end of the film the couple's youngest daughter says "Isn't life disappointing." while looking earnest and thoughtful, and the couple's daughter-in-law answers "Yes, nothing but disappointments." The worst example though is at the very end, when the old man is sitting alone in his living room. Suddenly the neighbour from the opening scene appears again and says "You must be feeling lonely with them gone." He answers "Yes." and he adds that he will be lonely now and the neighbour concurs "Absolutely, you'll feel lonely." The scene had the potential to be beautiful but it is ruined for me by this repetitive dialogue. This need to explain to us what is happening and treat the audience as if it had been taking naps during the film irritates me, and makes me hesitant to agree with the general consensus that Tokyo Story is a really great film, one of the very best. Another thing about Tokyo Story is how transparent it is that the mother will soon succumb to some unspecified illness. It is there from the beginning and clearly sign-posted repeatedly. Its alleged inspiration, Leo McCarey's remarkable Make Way For Tomorrow (1937), is actually more subtle, and for me the better film. Yet when critics write about Tokyo Story they see it differently. 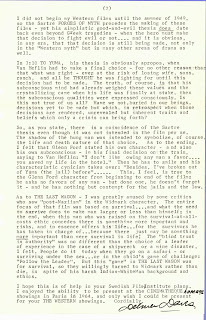 Here is for example Roger Ebert, who says that one of Ozu's strength is his way of "removing the machinery of effects and editing and choosing to touch us with human feeling, not workshop storytelling technique." But is not the opposite the case, and is not Tokyo Story actually very much an example of "workshop storytelling technique" by Ozu and his longtime co-writer Kogo Noda? This is not to deny that there are also many examples of subtlety. For example, in the opening scene when the couple is packing they have an argument about an air cushion. That says a lot about their relationship, without in anyway being explicit. As with my earlier comments about The Searchers (1956), I would not mind these issues I have with Tokyo Story if the film was not so good. But now they get in the way. By the way, in his review Ebert quotes Donald Richie, who says that "The reason for the low camera position /.../ is that it eliminates depth and makes a two-dimensional space." This is puzzling and I do not understand why a low camera position would eliminate depth. But more to the point, Tokyo Story has great depth, using both deep space and deep focus to telling effect. Perhaps especially in order to create a sense of the larger world, since the lives of their neighbours are often seen through windows in the background, but most of the shots, even those showing street scenes and nature, are carefully staged and framed to create depth. Finally, I have seen some 15 of Ozu's films and although it is hard to choose between them, if I had to pick one as my favourite, it would be I Was Born, But (1932). It is close to sublime. In an earlier post I wrote about the common but bad habit of comparing everything to Hollywood, and this tendency is something that is a consistent problem when it comes to Yasujiro Ozu as well. When critics and historians discuss him it is almost always focussed on how he had a unique style that was "the complete opposite of Hollywood" (as if all Hollywood films were in the same style), but it is much rarer to see comparisons between Ozu and for example Mikio Naruse or Sadao Yamanaka, even though that would be more apt.